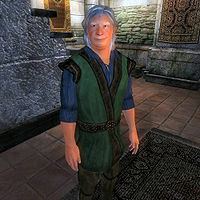 Edgar Vautrine is a Breton enchanter and proprietor of Edgar's Discount Spells in the Market District of the Imperial City. He sells a wide variety of cheap spells from all of the magical schools. He should have been able to sell you the unique Veil of the Seer but because of a bug, no Barter option is available. While the citizens of the Imperial City are skeptical of the whole concept of "discount spells", Edgar doesn't care and keeps his business up and running even though it means working long hours with only little spare time. Edgar sleeps in the private quarters above the shop every night between midnight and 6am and always starts the day with a two-hour breakfast in the main trading room. At 8am, he unlocks the doors to customers and spends the next twelve hours offering his services. Additionally, on Morndas, Middas and Fredas, he will keep the shop open all evening as well, not closing up before midnight. On all other days, he will close up shop at 8pm and go to different places in the City. On Tirdas and Turdas, he heads over to his colleagues at the Arcane University, just to hang out and meet some similar minded people. On Loredas, he goes to the Elven Gardens District to enjoy a four-hour dinner at the King and Queen Tavern. Sundas finds him in the Temple of the One for an evening prayer. He always heads back to his bed at midnight. He wears a simple set of common middle class clothing, a blue & green outfit and a pair of russet felt shoes. He carries around a spare pair of light brown linens, his shop key and a leveled amount of gold. In combat, Edgar relies on the same set of spells that you can buy from him at a very cheap cost. When you meet him for the first time in his shop, Edgar will introduce himself and his cheap wares: "Edgar Vautrine. You don't want the very best. You want cheap. And I got cheap." When asked about his city of choice, he will give you a piece of advice: "You want to buy or sell, the City is great. You want free? Go down the holes, kill some monsters. Sell your loot back in the city!" Other citizens will often comment on his low prices with negative remarks such as: "I understand money is tight, but buying discount spells seems like a bad idea." and "Isn't there something just wrong about buying 'discount' spells?" Other citizens will simply comment, "Have you ever shopped at Edgar's Discount Spells?" and, "If you're looking to buy cheap spells, Edgar's is the place to look." or respond with, "I'm not buying a discount spell. That's just a bad idea. ", "Discount spells. I'd just as soon buy a 'slightly used' shield. ", "Seems to me, some things are worth paying full price for." and "There are some things you shouldn't skimp on. Spells are one of them." Edgar will still talk and sell goods to you when you're a full vampire. It is not possible to invest in Edgar, even after you have reached 75 skill in Mercantile. Edgar only keeps the store open longer on certain days because he doesn't have anything else to do. None of his other AI packages are active between 8pm and midnight on Morndas, Middas and Fredas, so he keeps doing what he was already doing - serving in the store. No barter option is available for Edgar, therefore the unique item the Veil of the Seer cannot be bought from him.